Fundraising for the Santa Clothes Club is a year-round effort. We host events throughout the year so that we can clothe as many needy children as possible. Our main fundraising events include an auction, a telethon, a golf outing, and a spaghetti dinner - something for everyone! 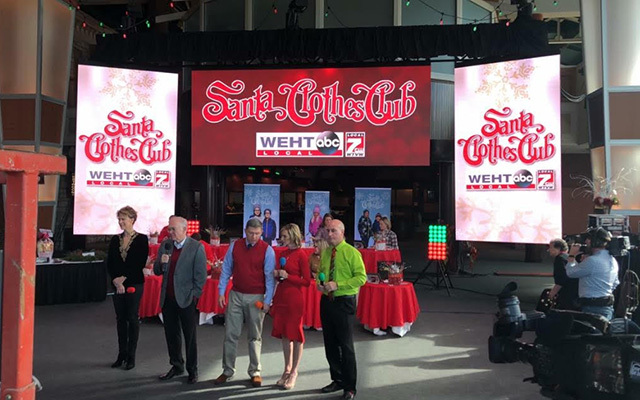 Our annual telethon, broadcast each year by WEHT and WTVW, allows generous folks in the Tri-State to help clothe needy children. Just $100 completely clothes one child from head to toe! Every year, our telethon helps to clothe more than 2500 children in need. Many thanks to Walmart for helping the Santa Clothes Club by providing the clothing needed, at cost, and donating the time and expertise of their personnel to properly fit each child. Without this commitment, it would be nearly impossible to clothe over 2,500 children each year.